It can be a problem remembering which discs are currently mounted and which ones you have unmounted (ejected). When I first got my Macbook Pro I wasn’t used to unmounting things and was constantly removing external drives physically without thinking. but it’s also bad for your Mac. 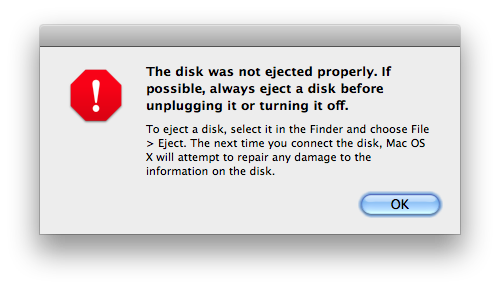 By default OS X does not show mounted drives on your desktop. But I think having them visible is the easiest way to keep track of what you’ve got mounted. Especially seeing as a drive can be unmounted but still physically plugged in to your Mac. That way you can actually physically see the devices that need to be ejected. The solution is really simple – just set OS X to show all the drives which are mounted by default. 3.) Select the drives you want to have visible. I don’t actually have my “Hard disks” visible as I never mount or unmount internal HDs. 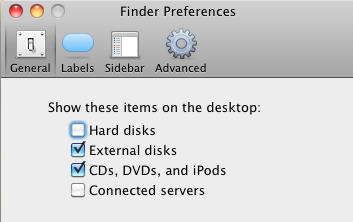 But with my current settings (above) all external items – phones, cameras, iPods, external HDDs, DVDs, CDs etc. – show up as icons on my desktop. Now you can see exactly what’s going on with your drives. Plus you never have to see that annoying message ever again. Keep up the great piece of work, I read few blog posts on this internet site and I think that your website is real interesting and holds circles of superb info .